One of my operating hypotheses as a sports media researcher has been that sports journalism perpetuates the Sport Ethic, primarily through its reliance upon players and coaches as sources for stories. And understanding the Sport Ethic is a key to understanding the significance of Tiger Woods’ victory. In fact, Woods’ entire career can be reflected in the four elements of the Sport Ethic. Woods, throughout his life, was shown to be dedicated to the game above all else. His last victory at a major before this weekend came in 2008, when he won the U.S. Open while playing with stress fractures in one of his legs (Accept risks and pay through pain). But it’s the second thread that has me thinking the most. The importance of winning in sports and the Sport Ethic. That life has a scoreboard and we are measured by our wins and losses. 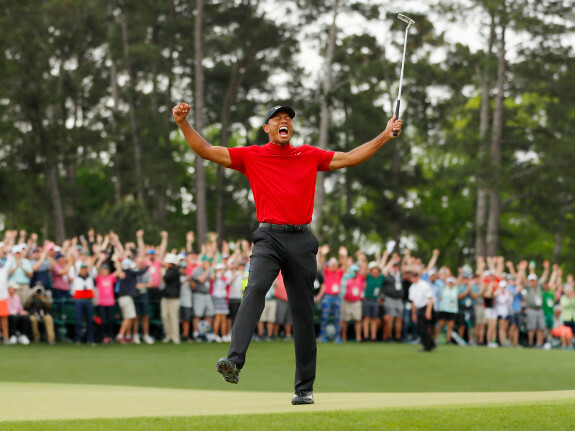 If there’s one thing that has bothered me a bit about the Tiger Woods coverage (aside from the “this is the greatest story in sports history” hyperbole), it’s the notion that he completed his comeback, vindicated himself, proved himself, because he won. To me, that ties personal vindication far too closely with success. As if his comeback would have been any less impressive personally if a ball had bounced an inch to the right on Sunday. As if his value as a person depended on his score, as if his hug with his son only mattered because he had the lowest score on the golf course. But of course, that’s sports, right? There’s a scoreboard, and there are winners and losers. And if you aren’t a winner, you are a loser. And if you are a winner, you are distinct. You are good. That is the essence of the Sport Ethic.